Episode Theme: Doing wrong brings consequences. 1. James 4:17 says that if you know the difference between right and wrong, and choose the wrong, it’s sin. How can you tell the difference between right and wrong? Is it a feeling? Is it knowing God’s word? Some of both? 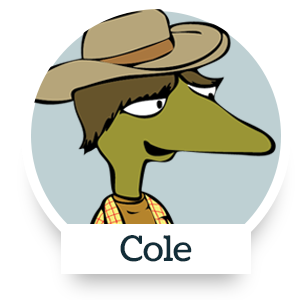 In this episode, Liz and his friends choose to do things that they are know are wrong, and end up suffering the consequences. Everyone makes mistakes. You break a toy or Mom’s favorite vase. You forget to do your homework. You accidentally hurt your brother or sister while playing a game. Mistakes themselves aren’t sins. But if you know before you do something that there’s a better choice—even if that choice doesn’t sound as fun—then doing it anyway is a sin. If you think “someone could get hurt” or “I’ll be in so much trouble” or “this isn’t right” before you do something, these are clues that what you’re thinking about doing is sinful. If you choose to do it anyway, you need to accept whatever happens as a result of your actions. It may mean a broken toy can’t be repaired. It may mean being disciplined (like staying in your room, cleaning up the mess, or apologizing and paying for damage). One way to avoid the temptation to sin is to ask yourself what could happen as a result of your decision. Are you willing to pay that price? Want to dig deeper and learn more about sin? Check out Genesis 4:7, Matthew 18:7, and Romans 3:23-24.
Who do Liz and Spike call when they’re bored? What happens to Grandpa Anole’s car? Liz drops a water balloon from a bridge, it hits Grandpa’s car, and the windshield cracks. 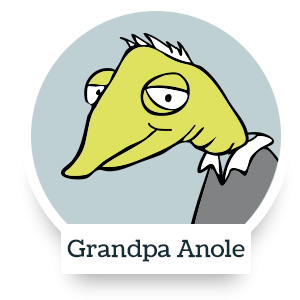 How does Grandpa Anole figure out it was Liz who dropped the water balloon that hit his car? Mr. Woolley calls Grandpa to complain that he caught Liz ding-dong-ditching his house, and that water balloons fell out of Liz’s pocket as he ran away. Why does Lucille tell Liz it was one sinful Saturday? Because Liz knew the things he did were wrong, but he did them anyway. In this episode, Liz and his friends made bad choices because they were bored. Why not make a “Bored Box” for your house? Come up with ideas for out-of-the-ordinary things to do, write them down, and then keep them in a small box. Need ideas? Look around with your family and find a game or puzzle you haven’t used in ages. Look at toys or books that have been neglected on a shelf. Find a recipe you have always wanted to try. Challenge yourself to build something. Write a skit. Fill the “Bored Box” with possibilities. The next time you’re bored, reach into the box, take out an idea, do what it says! No peeking!